Entwining fantasy with reality, Laura Thomas deftly weaves an intriguing story of fifteen-year-old Polly, who aspires to be a writer, and her struggles to become one. Mrs. Thomas’ debut novel, Polly Wants to Be a Writer: The Junior Authors Guide to Writing and Getting Published, showcases the all too real struggles of a teenager in modern day society trying to make it as a writer. However, not only does Polly have to deal with writer’s block and not being able to finish a story, she also has to deal with a dragon that suddenly appears in her bedroom. Named Scrum, this dragon imposes upon her life with snarky remarks and hurtful critics of her story. 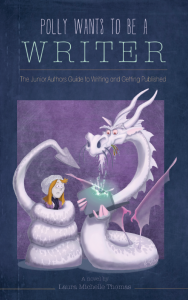 She goes to her favorite author, Ms. Whitford, for help with her dragon, and learns that Scrum is Polly’s inner literary critic. She must learn to control him if she ever wants to graduate from being a “wannabe” writer and become a full-fledged one. Along with Polly’s journey to tame Scrum and take control of her own writing, there are also several different interesting characters that make the book multifaceted and layered. Polly has to deal with Yulleg Snoblivski, a famous author her own age who goes to her school. Yulleg, in turn, has to deal with his own literary dragon (who has issues of his own), and the pushy publishing companies, when all he wants to do is quit writing once and for all. Not to mention parents with secrets; secrets about parents; dragons of all shapes, sorts, and smarts; and a power struggle for the last copy of a certain book. In this book, Mrs. Thomas not only engages you with an imaginative fantasy story and fictional world, but also educates you on how to tame your own literary dragon. Polly, and consequently the reader, learns about the ins and outs of the publishing world; as well as the process of writing a story from the first brainstorming session to the first draft. This book is good for anyone who holds an interest in writing but has never been sure of how to go about it, or has tripped over a stumbling block on the road to their finished story. Addressing all the common issues that most writers have grappled with, Ms. Thomas has created much more than just an instruction manual for transferring your story from mind to material. She has produced a book that is both informing and entertaining. I highly recommend this novel and guide for any “wannabe” writers out there.